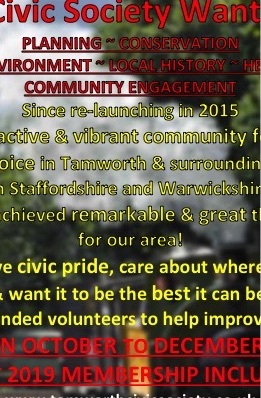 Are you considering becoming a Member of The Tamworth and District Civic Society? Since our launch in September 2015 we have been highlighting and campaigning vigorously on a raft of heritage, conservation, planning and environmental issues across the district. We provide an active programme of meetings, trips and social events for members, and reach out to the wider community via Website, Facebook,Instagram and Blog sites. Please join and help formulate what TDCS does as we continue to progress and develop. We welcome members getting involved with specific projects or topics that engage them. If you take pride and interest in where you live, and want it to be the very best it can be, join your Civic Society and make a difference! 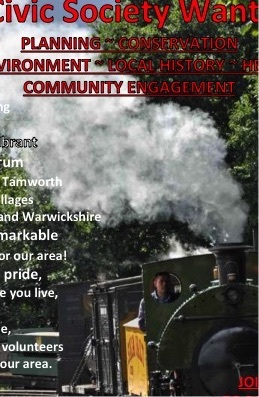 If interested please print, complete and return a membership application form, you may get one from Tamworth Tourist Information Centre (location on map below) or open and print this PDF file.